The only thing possibly worse than finding a stain on your wedding dress is finding a pull in the fabric of your gown which resulted from the events on your wedding day. Throughout your wedding day there are many unfortunate events that could cause the material of your dress to become damaged. A fabric tear on the hemline caused by a misstep as you step out of the limo, loose threads in the shoulder area from a good time on the dance floor, or a thread that was pulled by a spur in the back of your chair as you dined at the head table. All have the potential to cause stress on the delicate fabrics of your wedding gown, and worse, cause stress and worry for a bride that loves her dress. At this stage of your preservation your dress has been thoroughly inspected, meticulously cleaned with our exclusive SYSTEMK4 wedding gown cleaning process, and carefully repaired if any minor fabric issues were discovered. You wedding dress is now ready to be placed in its own beautiful preservation chest with viewing window to be protected from dust and UV damage and will soon be ready to be viewed and enjoyed by future generations. Our exclusive wedding gown preservation chest is acid neutral and only contains acid-free tissues paper in accordance with recommended fabric handling guidelines issued by the International Fabricare Institute. The Wedding Gown Preservation Kit features a unique tie-down system that is designed to keep your gown secure in the kit without causing any stress to the fabric. Your gown is carefully placed and secured in the kit after a light pressing to ensure no wrinkling of the fabric occurs over time. Your 3 optional accessories will also be secured in the preservation chest at this time. What happens if my gown requires more extensive repairs? If your gown has more than just a slight tear, pulled material, or loose adornments, our team will call you to review options and any additional charges that might be incurred in the process. We will never make a major repair without your consent. I have an adornment that became loose and fell off my gown during my wedding day, what can I do? Please include any adornments in your garment bag when initially sending your gown to us and we will have our seamstress reattach for you. Please be as detailed as possible in your paperwork. In some cases we may have extra adornments we can use for your gown if yours were lost or misplaced after your wedding day. My train/gown is very large and I’m worried it won’t fit in your preservation chest. Where will my accessories be placed in the preservation chest? Unless we receive specific requests otherwise, all preserved accessories will be placed at the bottom of your kit, outside of the viewing window with the exception of you veil. Your wedding veil will be secure to the side of you wedding dress so that both your veil and your gown are displayed beautifully side-by-side. I have many accessories that I want to preserve. Can I have these preserved outside of my preservation chest? 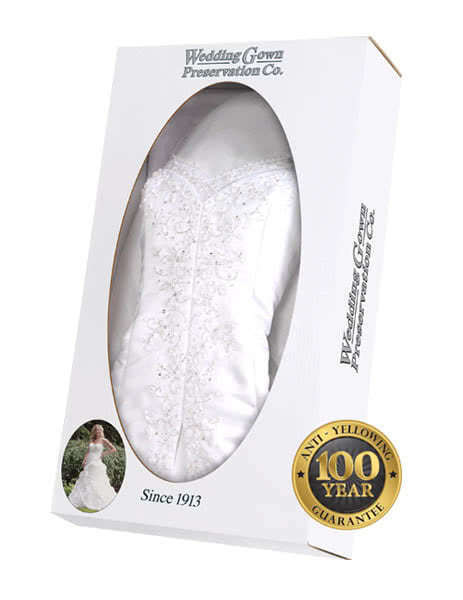 Yes, for a $25 fee (please include a check along with your paperwork when you send in your gown and accessories) we can place your items in their own small preservation box that includes our 100 year guarantee and viewing window. We have many brides that choose to have their ring bearer pillows, gloves, shoes and more in this unique miniature preservation kit. You will receive all the paperwork necessary when sending in your dress to us with our Wedding Gown Preservation Kit. Do You Have Additional Questions About Repairs & Boxing?